It really stuck out to me and reminded me of what I have been hearing about and learning at church over the last few weeks. We have been in the book of Ephesians (a favorite for a lot of people, myself included) and it is full of tons of practical applications for my daily life as a Christian. It is so easy for me to get caught up in what’s going on in my life and what ‘seems’ to be important; but how often do I look at my life through my position in Christ to see what is actually important? Am I getting caught up in the things of this world and on my selfish wants rather than focusing on loving others and living a life that glorifies God? Yes. All too often that is exactly what happens. 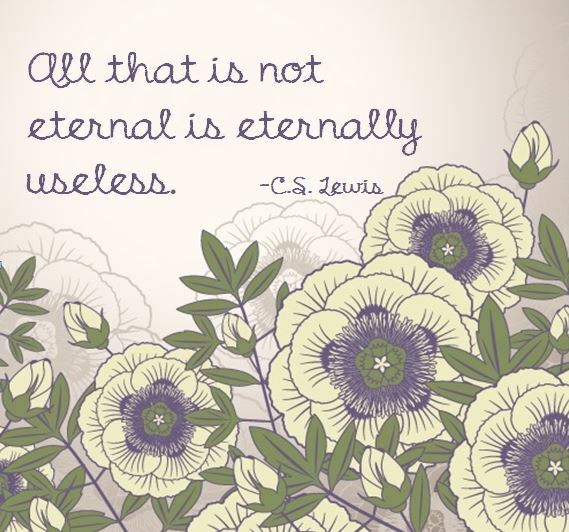 Just like Lewis said, I need to be thinking in terms of what is eternal, and realize that everything else is eternally useless. There are so many verses (from Ephesians alone) that can be used as a reminder and as encouragement to live life this way; and here is one of them! Happy Sunday! ¹As a prisoner for the Lord, then, I urge you to live a life worthy of the calling you have received. ²Be completely humble and gently; be patient, bearing with one another in love. ahh.. So true! Unfortunately, it’s much too easy to get caught up in all this worldly, material stuff and accomplishments, but we have to remember that in the end, the Earth and everything on it will burn and we’ll be left standing before the Lord answering for everything we thought, said and did while we on this planet. And that is an intimidating thought!